Though perfectly located there are problems. The park is located in a narrow gulch this in itself poses problems with cell phone service (vurtualy none). WIFI was weak and faded in and out. There is difficulty navigating roads (narrow) especially entry road. During my stay the people in the site next to me had their 5th wheel jacked up doing repairs through the night. People operating were nice, however there is need for updates, improvements and attention to what is going on in the park. OK if you are only staying one night. 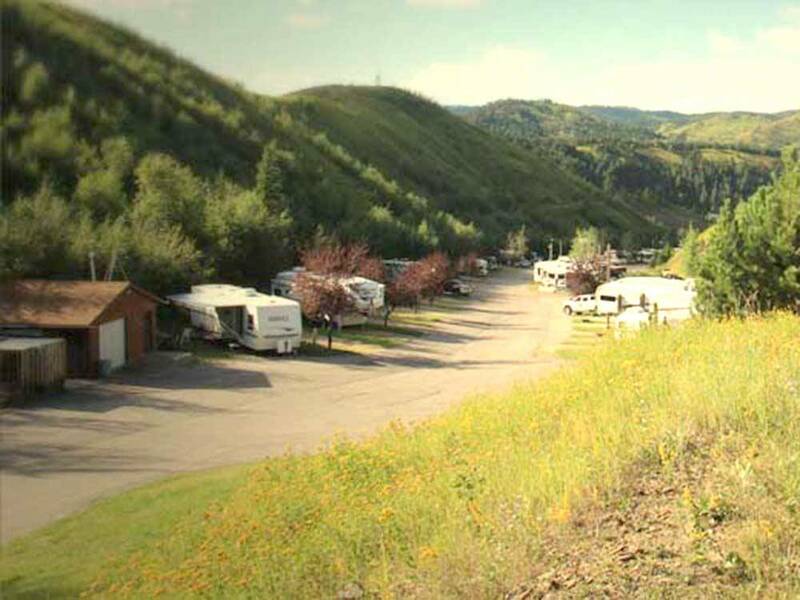 This rv park is disgusting and we will never, ever, stay there again. How this park got a 9.5 rating by Good Sam is a mystery. The restrooms and showers were filthy, our fire ring had beer cans and trash in it when we arrived. We told the owner and we were told that they had been too busy to clean. The trash was overflowing so much at the dumpster site that we were unable to take out our trash. The owner told us the trash trust had not come the previous day to empty the dumpster. There were drunk, rowdy, disruptive people at this park the entire time we were there. They climbed onto the roofs of their rv'S and drank beer and yelled at the top of their lungs. We told the owner, and showed the woman at the desk a picture of them doing this and nothing was done. This is definitely not a park for families with children. When we made the reservation we told the woman on the phone that we had a 35 foot long motorcoach with a tow trailer. We were promised a 61 ft site. The site we were given was not large enough for the coach and our car stuck out in the roadway. We were lied to. This park has everyone jammed in much too closely. It is not safe. If you have a motorcoach and they do not give you a pull through, do not stay here. Your coach could get damaged. Our trailer was hit while we were there. The price is also high. We paid $45.00 per night for two nights to stay in a loud, disruptive, dirty, dump of a park. Never again! Never. The location with respect to town is awesome. The park itself is another story. The park is located in a gulch. This in itself creates issues. Hard to get either cell phone or TV reception. The campground is long and narrow with the office close up front. The further you go away from the office, no WI-FI. Put all three together ... no communications with the outside world. The facilities are older and need updating. The office looks cool from the outside but becomes very boring once you enter. Very poorly used. The employees working when I checked in were nice ... well they were not rude. They hardly spoke and had difficulty operating the check-in system. The layout of the campground is awkward. as you go up the gulch, your campsite starts getting more slanted. Our picnic table sloped from left to right about 10-12 inches. The only flat spot on our site was the gravel pad we parked our 5th wheel and truck on. No additional room for a table. We could not even sit outside on level ground without sitting under our tongue. If you don't want to communicate with the grandchildren or check email or sit outside, or use the facilities, or watch any TV, this is your campground for location only. WIFI does not work all the time. Very Poor Location. Will NOT stay at this facility when I return. Good Sam has this rating for restrooms all wrong. They were horrible, mold growing in the showers, white PVC pipe ran for the showers with a wee tiny shower head, no water pressure. The park is nice, lots are roomy but not worth the money charged. From Jct US 85 & US 14A: Go 3 mi S on US 85 (L); or From Jct US 385 & US 85: Go .5 mi E on US 85 (R).